If you've seen a religious Jewish man walking around with what looks like a relic of colder days in Russia, you might be curious what this head attire, called a shtreimel (pronounced shtry-mull), is. Shtreimel is Yiddish, and it refers to a specific type of fur hat that Hasidic Jewish men wear on Shabbat, Jewish holidays, and other festivities. Typically made of genuine fur from the tails of Canadian or Russian sable, stone marten, baum marten, or American gray fox, the shtreimel is the most costly piece of Hasidic clothing, costing anywhere from $1,000 to $6,000. It is possible to buy a shtreimel made of synthetic fur, which has become very common in Israel. Manufacturers in New York City, Montreal, B'nei Barak, and Jerusalem have been known to keep the secrets of their trade closely guarded. Usually worn after marriage, the shtreimel satisfies the religious custom that Jewish men cover their heads. The bride's father is responsible for buying a shtreimel for the groom. Some men own two shtreimels. One is a relatively inexpensive version (costing around $800 to $1,500) called the regen shtreimel (rain shtreimel) that can be used when it might get damaged by the weather or for other reasons. The other is a more expensive version used only for very special events. However, because of hard economic circumstances, most members of the Hasidic community only own one shtreimel. Although there are differing opinions about the origins of the shtreimel, some believe that it is of Tatar origin. One story tells of an anti-Semitic leader who issued a decree that all male Jews would be required to be identified on Shabbat by "wearing a tail" on their heads. While the decree attempted to mock the Jews, the Hasidic rabbis held that under the Jewish law, the law of the land in which they were living was meant to be upheld, as long as it didn't obstruct Jewish observances. With this in mind, the rabbis decided to make these hats mimic those worn by royalty. The result was that the rabbis turned an object of mockery into a crown. There also is the belief that the shtreimel originates in one of the most important Hasidic dynasties of the 19th century, the House of Ruzhin and, more specifically, with Rabbi Yisroel Freidman. Smaller than shtreimels worn today, this 19th century shtreimel had a raised and pointed, black silk skullcap. After Napoleon conquered Poland in 1812, most Poles adopted western European dress, while Hasidic Jews, who wore a more traditional style, kept the shtreimel. Although there is no specific religious significance to the shtreimel, there are those who believe that having two head coverings provides additional spiritual merit. A kippah is always worn underneath the shtreimel. Author Rabbi Aaron Wertheim quoted Rabbi Pinchas of Koretz (1726-91) as saying, "The acronym for Shabbat is: Shtreimel Bimkom Tefillin," meaning that the shtreimel takes the place of tefillin. On Shabbat, Jews don't wear tefillin, so the shtreimel is understood as a holy type of clothing that can enhance and beautify Shabbat. Aside from Hasidic Jews, there are many religious Jewish men in Jerusalem, called "Yerushalmi" Jews, who wear the shtreimel. Yerushalmi Jews, also known as Perushim, are non-Hasidim who belong to the original Ashkenazi community of Jerusalem. Yerushalmi Jews usually begin wearing a shtreimel after the age of bar mitzvah. The most recognizable shtreimel is that worn by the Hasidim from Galicia, Romania, and Hungary. This version was worn by Lithuanian Jews until the 20th century and consists of a large circular piece of black velvet surrounded by fur. The shtreimel of the Rabbi Menachem Mendel Schneersohn, the Tzemach Tzedek, a Chabad rabbi, was made from white velvet. In Chabad tradition, only the rebbe wore a shtreimel. 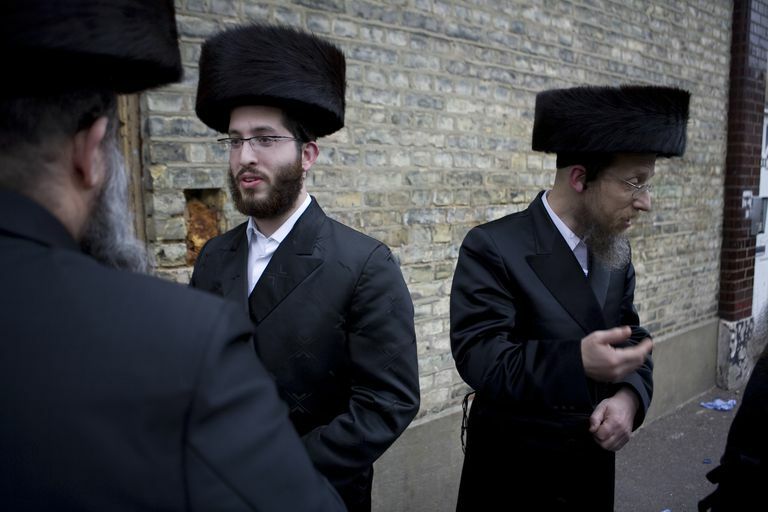 Hasidic Jews who hail from Congress Poland wear what is known as a spodik. While shtreimels are wider and disc-shaped, as well as shorter in height, spodiks are taller, thinner in bulk, and more cylindrical in shape. Spodiks are made from fisher tales, but also have been made from fox fur. The largest community that wears spodiks are the Ger Hasidim. An edict by the Grand Rabbi of Ger, understanding the restraints of finances, declared that Gerer Hasidim are only allowed to buy ​spodiks made of fake fur that cost less than $600. The rebbes of the Ruzhin and Skolye Hasidic dynasties wore shtreimels that were pointed upward.